Lena Corwin's Made by Hand Premieres Today! We're thrilled to announce that Lena Corwin's Made by Hand is officially on sale today! From knitting, embroidery, and weaving to screen printing, tie dye, and jewelry-making, this book is a treasure trove of beautiful, inspiring projects for both the beginner and the creatively adventurous. And, of course, Lena's lovely book trailer is not to be missed. For a big dose of creative inspiration, watch the whole thing above or take a peek at the images in our photo gallery (seriously, does it get more beautiful than that cover?). But be forewarned—once you do, you won't be able to fight the urge to go out and make something! Lena Corwin's Made by Hand is available now, wherever books are sold. I'm very happy to report that Hannah Rogge's newest book Save this Shirt: Cut It, Stitch It, Wear It Now has been named a 2008 Quick Pick for Reluctant Readers by the Young Adult Library Services Association (YALSA), a division of the American Library Association. This is Hannah's second YALSA honor. 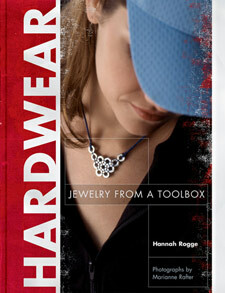 Her first book, Hardwear: Jewelry From a Toolbox, earned this award in 2007. -To see a gallery of projects from Save this Shirt, click here. -To see a gallery of projects from Hardwear, click here. -To read about a weekend Hannah I spent together in November, click here (and scroll down). -For a list of all of this year's YALSA winners, click here. -And please join me in congratulating Hannah--an extraordinary crafter, author, and friend. 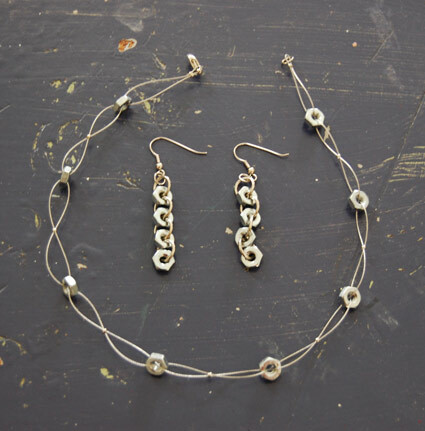 On Sunday morning Hannah taught me how to make the Elegant Nut Necklace and the Washer Chain Earrings from her book Hardwear (except I substituted hex nuts for the washers on the earrings). Total work time: Less than an hour to finish both pieces. When I tell people that I edit craft books for a living, they often assume that I spend my days doing crafts--knitting, quilting, jewlery-making, etc. But, unfortunately, that's not my reality. Although I spend a lot of my time collaborating with really creative, industrious people, I spend far less time making things than I would like. But this weekend is a happy exception. Hannah Rogge, the author of Hardwear, a book about creating jewelry using materials you buy at hardware stores (like hex-nuts, O-rings, and S-hooks), is coming to my house for a crafty sleepover. She's going to help me make jewlery and I'm going to teach her how to knit. I've posted a gallery of some of the projects from Hardwear here. I'm not sure what we'll be creating yet, but I'm definitely thinking about holiday gifts (like crafters all over the world this weekend, I imagine). If you look at the gallery, I suspect you'll be impressed by the elegance of these pieces, most of which take less than an hour to complete. Ever since Hannah and I met for the first time to discuss her proposal for this book, she and I have been fantasizing about people making these pieces and wearing them not only with their casual everyday clothes but also with fancy attire to formal occasions (like the Academy Awards!). Please let us know if you do.